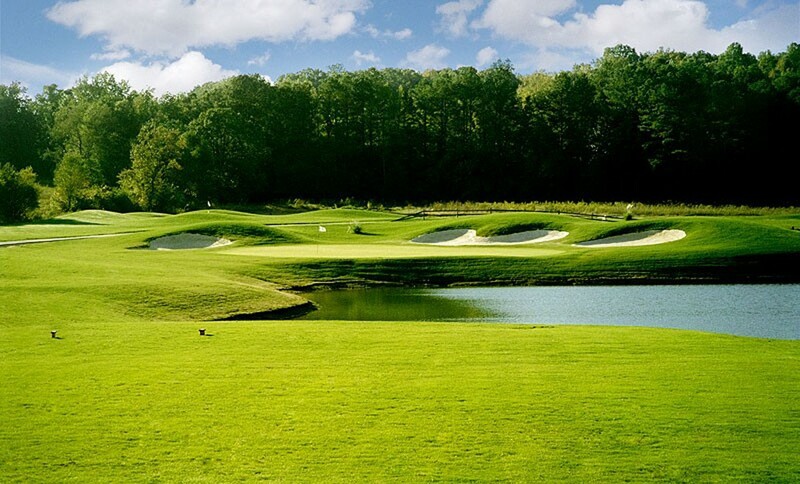 The Hooch was chosen as one of the Top 12 Short Courses in North America from 2005-2010. 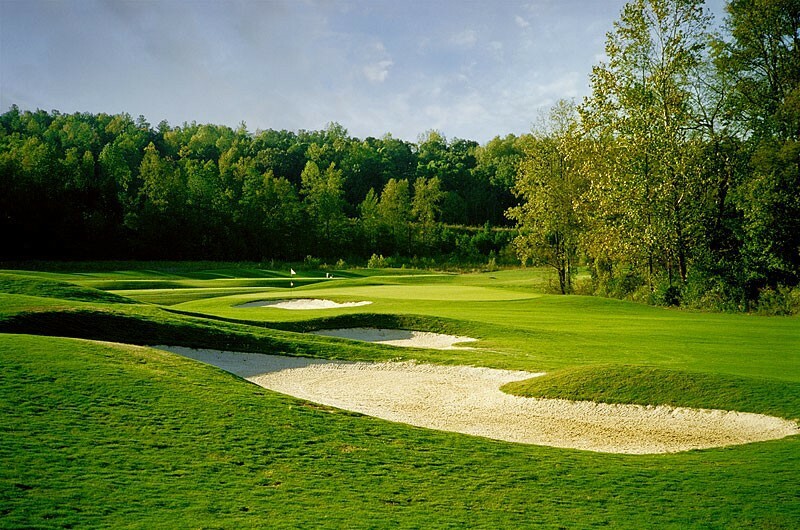 The Hooch Golf Club is one of the top executive length courses you will find. Although it only stretches to 4,100 yards and has a par of 61, I wanted players to hit nearly every club in their bag and be tested mentally. The design is strategic with plenty of risk versus reward opportunities. Water comes into play on nine holes and the greens are fairly small, requiring precise approach shots. One of the things that gives me the most satisfaction about the Hooch is that every time I visit the course I see an amazing cross-section of golfers; parents playing with their kids, ladies, seniors, weekend golfers, low handicappers, etc. The 360 yard, par four 16th hole at The Hooch Golf Club has one of the toughest tee shots on the course. 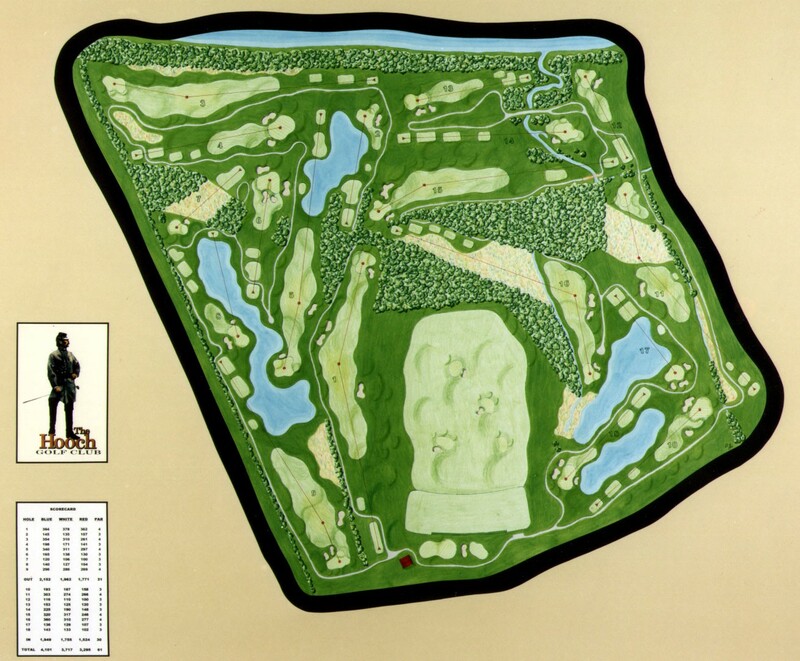 Requiring a carry over wetlands, players should use the two target bunkers at the far side of the sharp dogleg for aiming purposes. A well-positioned drive leaves a short approach to a green where flag position has a major effect. If the flag is on the right portion of the green, it is very accessible, while flags on the left third bring the greenside bunker and lake into play. The prudent play to a left side flag is to aim for the center of the green and hope to catch the bisecting slope that feeds the ball to the left. One of the most picturesque holes at the Hooch, the 136 yard 17th routinely see a wide range of scores. It is a great hole when a match is tight. For those confident of their distance control, it is hole to take dead aim at the flag. For those struggling, the hole offers a bail-out area left of the green, leaving a short chip to a green that pitches moderately from back to front.